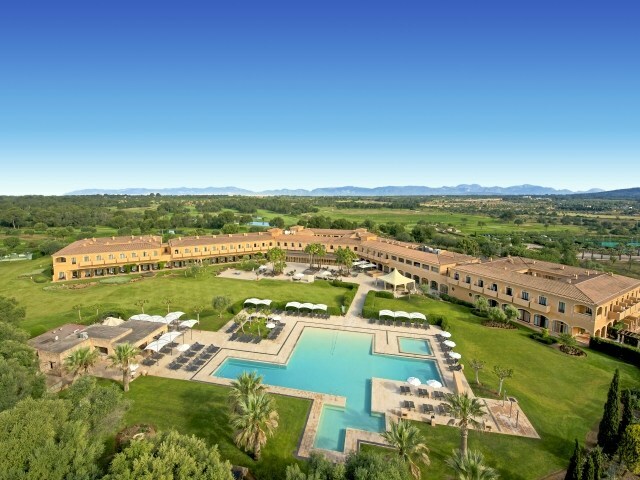 Luxury hotel located in the beautiful countryside of Mallorca, approximately 20 minutes by car from Palma de Mallorca and 15 minutes from the airport. Two well recommended restaurants and two bars (poolside bar and bar/lounge). Two beautiful swimming pools set in lush surrounding gardens, and one indoor pool. Children’s Club with outdoor pool for children. Two beautiful designed 18-hole golf courses and driving range and two putting greens. Miniature golf, table tennis and four tennis courts. Hotel shops, mini market and barber/beauty shop. Health club with full-service Spa treatments, heated out door pool, sauna and fitness center. Business center with great conference facilities. Free parking. The hotel opened in year 2000. All rooms (30 m2) with view over the pool or the golf courses. Bath/shower, WC and hairdryer. Telephone, cable-TV with in-house movies, mini-bar. Ironing/ironing board, safe deposit box. Wireless high-speed Internet access (surcharge).